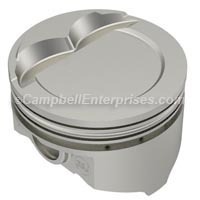 One of the most popular items in our line up of 360 performance parts are replacement pistons and rings. 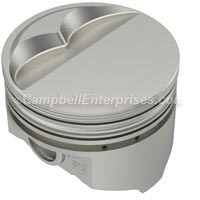 High performance KB Chrysler Plymouth Dodge 360 pistons offer a significant performance improvement for your engine, at a very affordable price. We have these piston sets available in a wide range of sizes including standard bore and many popular oversizes. 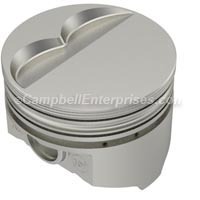 Also included are 360 stroker pistons that are used with a 4 inch stroker crank to build a 360 into a 408 cubic inch engine. 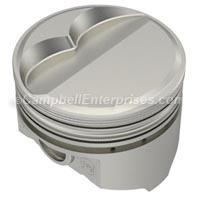 If you are rebuilding a Chrysler, Plymouth, Mopar, Dodge 360 small block engine and are looking for improved performance, without the higher cost of forged pistons, KB performance pistons are an excellent alternative for many street, muscle car restoration, cruising and street / strip applications. NOTES: Centered pin. Piston may protrude on 1992 and up Magnum truck blocks. Elevated Quench Dome .050" tall. Max connecting rod pin end width 1.000"
NOTES: Centered pin. Piston may protrude on 1992 and up Magnum truck blocks. *.070 oversize can be used in a .030 oversize 340 block with a 360 crank. NOTES: Centered pin. Piston may protrude on 1992 & up Magnum truck blocks. Quench dome elevated .085". Machining required to achieve optimum quench. Will not work with Magnum or Edelbrock closed chamber heads. *.070 oversize can be used in a .030 oversize 340 block with a 360 crank. NOTES: Centered pin. Piston may protrude on 1992 and up Magnum truck blocks. NOTES: Centered pin. Max connecting rod pin end width 1.000". Use with open chamber heads, has an elevated .085" quench dome. Can be used with closed or open chamber heads, no quench dome. 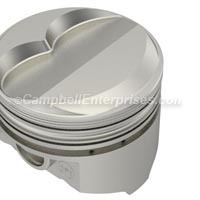 While you are replacing your engine pistons it is a good time to also upgrade your rotating assembly by installing modern connecting rods. Why risk damage to your rebuilt performance engine by using old stock connecting rods that have been through who knows what kind of abuse. With the high cost of machine shop service these days you can often upgrade to far stronger modern rods for not much more than the cost of reconditioning a set of stock rods. 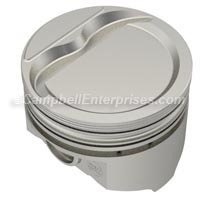 Eagle Specialty Products SIR connecting rods are an economically priced alternative to the time and expense involved in reworking a set of stock OEM rods. SIR connecting rods are forged from 5140 steel and most are available for both pressed fit pin use, or bushed to work with full floating piston pins. ESP I beam SIR Eagle connecting rods utilize ARP bolts and nuts. Eagle SIR rods are economically priced and are often less expensive than having your old stock rods reconditioned.